What is leaf streak? 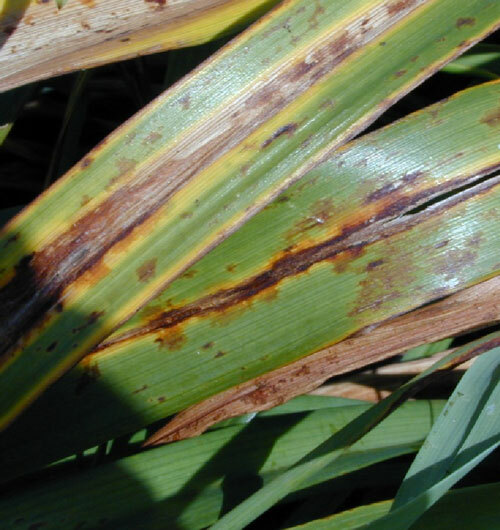 Leaf streak is a common disease of daylilies, affecting daylilies wherever they are grown. Daylily varieties can vary widely in terms of their susceptibility to the disease. Oftentimes leaf streak is a cosmetic problem, causing little damage. In some cases however, leaf streak can cause substantial leaf loss, and rarely it may lead to complete defoliation of daylily plants. Where does leaf streak come from? 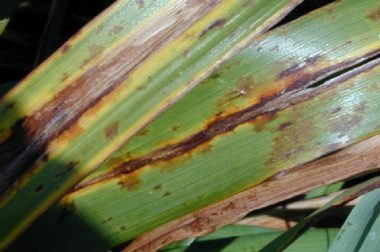 Leaf streak is caused by the fungus Aureobasidium microstictum. This fungus overwinters in infested daylily leaf debris where it produces spores that initiate the disease each spring. Spores produced on infected leaves lead to additional infections. The disease is most common in warm, wet weather. How do I save a plant with leaf streak? Remove infected leaves as they appear, and fertilize and water your plants properly to promote growth of new leaves. DO NOT water with a sprinkler. This can spread the leaf streak fungus, as well as wet leaves, creating conditions more favorable for infection. Instead, use a soaker or drip hose to apply water directly into the soil. To further limit pathogen spread, avoid working with plants when they are wet. How do I avoid problems with leaf streak in the future? Remove dead leaves from your daylilies each fall to eliminate a source of the leaf streak fungus. Burn (where allowed by local ordinance), deep bury or hot compost this material. As your daylily plants grow, divide them into smaller clumps and replant them with ample space between clumps. This will improve air circulation and promote more rapid drying of leaves. Consider using daylily varieties (e.g., ‘Betty Bennet’, ‘Edna Spalding’, ‘Ella Pettigrew’, ‘Globe Trotter’, ‘Nancy Hicks’, ‘Pink Superior’, ‘Ron Rousseau’, ‘Sudie’, ‘Tropical Tones’, ‘Upper Room’, ‘Winsome Lady’) with reported resistance to leaf streak. Keep in mind however that even resistant varieties may not perform well every year and under all environmental conditions. If you grow daylily varieties that suffer from severe leaf streak every year, consider applying fungicides containing chlorothalonil, mancozeb or thiophanate-methyl to prevent the disease. Use fungicides only during periods of wet weather. Start applications before you see symptoms and treat every seven to 14 days as long as wet weather persists. DO NOT use the same active ingredient for all treatments. Alternate the use of at least two active ingredients to help minimize problems with fungicide-resistant strains of the leaf streak pathogen. Be sure to read and follow all label instructions of the fungicides that you select to ensure that you use them in the safest and most effective manner possible.